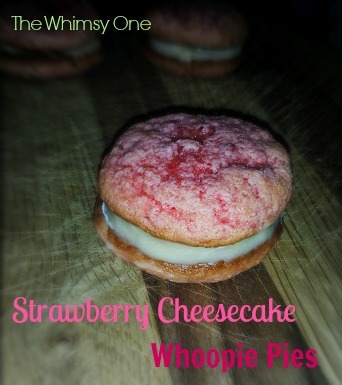 Strawberry Cheesecake Whoopie Pies-Guest Post! So remember a few weeks ago how I went to the blog meetup and met some awesome bloggers? Well today I am here to introduce you to the wonderful and whimsical Maddie from Tinge of Whimsy and The Thankfull Tummy. Her whoppie pies are drool worthy so I asked her to come on over and share them with you. Add them to your "to-bake" list this week. I know they are going to be on mine! Go on over and visit her and show her some love! Hi everyone, I am Maddie and I blog over at a Tinge of Whimsy. I am so excited to be over here in Hannah's little piece of bloggy land, sharing a recipe with you guys. I make a lot of whoopie pies over in my world and I wanted to share a simple summer option with you guys while we still have a little of it left! I love to play around with flavors and had made chocolate covered strawberry ones and decided that a strawberry chessecake option was a must. This is a quick and 'semi homemade option' (channeling Sandra Lee today;) I combine a box cake mix with fresh strawberries and whipping cream to make a light, yet tasty treat. For the filling, cream softened cream cheese on low for 1 minute to get fluffy, add the pudding packet and 2 tbsp heavy whipping cream, beat until fully incorporated and slowly add the whipping cream and beat until peaks begin to form. or for alternate version, prepare the pudding w/1 cup cold milk, mix w/cool whip. Place in fridge for hour to let either version set up. Place a dollop in the middle of one cookie and top with another, pressing down to spread filling. This should be refrigerated over night. And I have made with the fresh berries and without. You could also add them to the filling. You can't really go wrong. Thanks so much for having me over here today, Hannah! I love your blog and seeing all the decadent options you have for me! I hope you will come say "hi" You can find me at my lifestyle blog, Tinge of Whimsy or at my other food blog, The Thankfull Tummy.